Indonesians suspected of having bird flu can now be forced to go into hospital, under "extraordinary" measures imposed by the government. Bird flu has already killed four people in the country, and six others showing symptoms of the disease have been admitted to a Jakarta hospital. Two are employees at a zoo which has been temporarily closed after birds there were found to have the virus. Blood samples from all six patients have been sent to Hong Kong for tests. 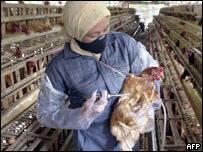 The latest wave of the deadly H5N1 strain of bird flu has already killed dozens of people throughout South East Asia. Millions of birds have been culled in the region in an effort to stem the crisis, although at the moment Indonesia continues to favour vaccination as a way to combat the disease. The World Health Organization has warned that the virus is continuing to develop, and the possibility of human-to-human transmission remains a real threat. Georg Petersen, the WHO representative in Jakarta, described the situation in Indonesia as "serious", and welcomed the new regulations imposed on Tuesday. Health Minister Siti Fadilah Supari said on Tuesday that the government was "very concerned" about the spread of bird flu in Indonesia. She told reporters the "extraordinary" status would last 21 days, but could be renewed if and when necessary. "This is to calm people, not to bring more panic," she said of the new measure. Of the six possible bid flu cases, she said that "two are almost certain to be bird flu cases". "Four others are still under observation, but despite having shown symptoms of bird flu, their laboratory tests are still negative," she said. Forty-four state hospitals have been designated centres for the treatment of bird flu. More than $15bn has been allocated to tackle the spread of the virus, but government ministers acknowledge that this figure is unlikely to be sufficient. Agriculture Minister Anton Apriyantono warned there was not enough money to carry out the mass culls recommended by the WHO as the most effective way to contain outbreaks of the disease. Meanwhile Siti Fadilah Supari says she has requested 10,000 more doses of the drug known to be the best treatment for bird flu. But she said Indonesia had to get in the queue with other countries.